A global innovator of premium conveyor belt cleaning and sealing systems has announced the creation of its newest factory-owned manufacturing facility in Queensland, Australia. Martin Engineering has been a supplier of premium components since 1944, providing bulk handling solutions and flow control equipment in the region through a licensee since 1978. The new facility will provide direct sales, service, training, and manufacturing to the continent, serving key industries such as mining, cement, sugar, quarrying, and bulk handling ports. The move will provide factory-direct customer access to locally-manufactured products, as well as technical service from experienced and factory-trained technicians. Company officials say that having local production will also allow Martin Engineering to supply its products at lower prices, reducing the overall cost of ownership. Among the manufacturing capabilities are the firm’s proprietary technology for producing belt cleaner blades, using its custom-built work cell. The manufacturing cells are designed, engineered, and constructed by Martin, and the unique processing technology is being implemented at Martin locations on six continents to deliver premium-quality components around the world with unrivalled consistency and wear life. The system is believed to be the only one of its kind dedicated solely to producing belt cleaner blades. Martin Engineering’s supplier for the chemical components of its urethane formulations is BASF Corp., one of the largest chemical companies in the world, with more than 110,000 employees operating in 80+ countries. As a result, customers receive blades with the same quality and guaranteed performance, regardless of their location. 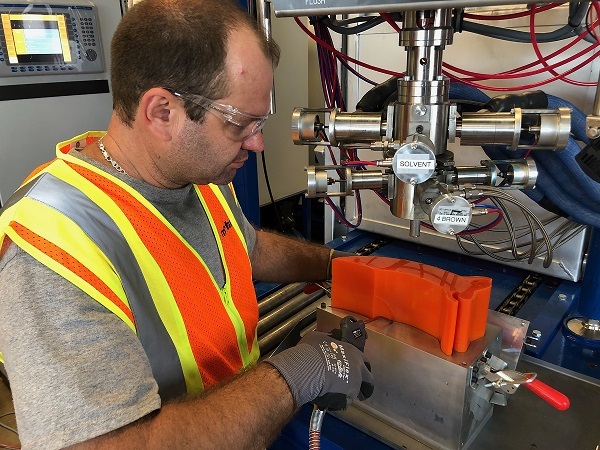 “Our computer-controlled molding operations around the world are monitored at global headquarters,” said chief technology officer Paul Harrison. “In fact, we’re able to remotely monitor functionality from any location that has an Internet connection, anywhere in the world. The Australia Business Unit will be led by managing director Terry Thew, who has more than 30 years experience in bulk material handling, along with commercial director Chris Wilson, a veteran of 10+ years. They will be joined by financial controller Bo Hu and flow aids specialist Grant Goodey, who will focus initially on applications for air cannons and engineered vibration.